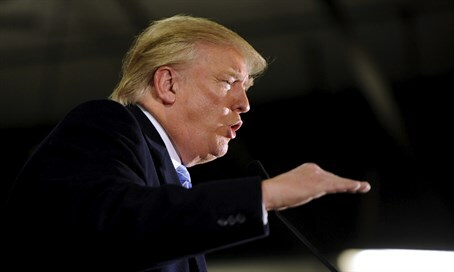 Republican presidential frontrunner Donald Trump on Tuesday came out for the first time and echoed the promises of his rivals, Senators Ted Cruz (R-TX) and Marco Rubio (R-FL), by vowing to move the US embassy from Tel Aviv to Jerusalem. In an interview on The Brody File, a show on the Christian Broadcasting Network, the real estate mogul was asked if he agreed with Cruz and Rubio in their pledges to move the embassy if elected. "They want it in Jerusalem. Well I am for that 100%. We are for that 100%," Trump said, in his first promise to have the embassy resituated in the 3,000-year-old capital of the Jewish people. He went on to call US President Barack Obama "the worst thing that has ever happened to Israel," over his controversial Iranian nuclear deal, and said, "I will be very good to Israel. People know that. I have so many friends from Israel. I have won so many awards from Israel. I was even the grand marshal for the Israeli Day Parade a few years ago. So I will back Israel." Trump's promise to move the embassy clashes with statements he made in December while speaking at the Republican Jewish Coalition, when he refused to rule out dividing Jerusalem as part of peace talks he said he plans to foist on Israel. At the Republican Jewish Coalition event, he said, "you can’t go in with the attitude ‘we’re gonna shove it down your,’ you’ve got to go in and get it and do and do it nicely, so that everybody’s happy." At the same event, he made an apparently anti-Semitic comment, telling the crowd of Jews, "you're not going to support me because I don't want your money. You want to control your own politicians, that's fine." He also placed the onus for the lack of peace on the Jewish state, saying in an interview, "a lot will have to do with Israel and whether or not Israel wants to make the deal - whether or not Israel's willing to sacrifice certain things." Back in 1995 Congress passed a law obligating the US to move its embassy to Jerusalem, but it gave the president a waiver that each president since has exercised, citing unspecified national security interests.